My artwork project is an art piece for humanity and for all people in the world whether they are Muslims or non Muslims. It's a piece for all religions and nationalities. 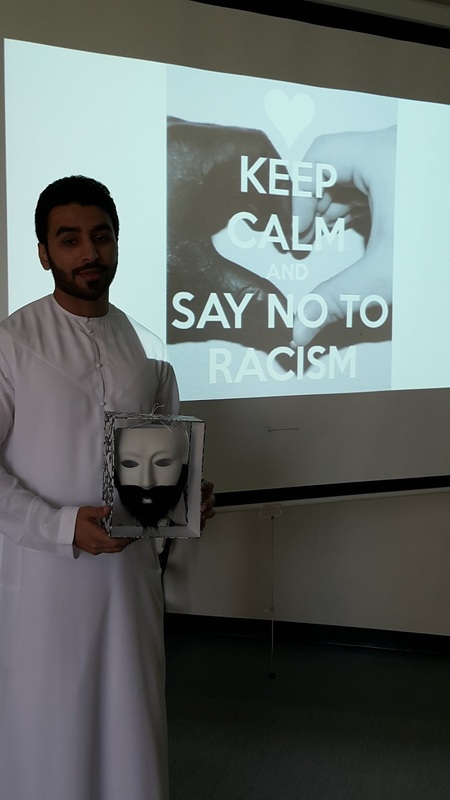 It's an artwork that represent peace and against racism. I called it " Just Hair" . Just Hair as shown in the picture above; the picture above is a clip art represent just a beard and mustache. My artwork will be something similar to this. It will be a long beard and mustache without a round face that is abstracted . What I mean with abstract is that this round face will not show any face features like " eye, nose, or mouth" . It will be a plain face with just a beard and mustache . In the middle of the face will be a question mark. This question mark will gives a space for the audience to think and choose what kind of man will be in that face. Then, depend on this decision , they will judge the beard. The point from the artwork is racism. Recently, for the past ten years , Muslims have been criticized for their beards . And each person who had a beard has been criticized and called terrorist. This started to be a signature for terrorism when an Arab man had it. Each person had a long beard from the Middle East called terrorist from western perspective. Even in western movies when they view Arabs , they viewed them with long ugly beards. In addition, this is not the case only in west. In the Middle East after Arab Spring people started to be scared from beards. A lot of people shaved their beards especially who are in the levant because they are afraid to be caught or considered as a part of ISIS " Islamic State of Iraq and Syria" . And on the other side there are some people who were afraid to shave their beards in Syria and Iraq , so ISIS do not accused him that they are not religious . Thus, beards was a crucial point in the recent years . But surprisingly last year , the beard was the trend and the style of the year for all people in the east and the west. Most of the men were having beards and not any beard. They keep their beards to grow longer and longer. Most of models and celebrities went with the beard trend. Maybe this started in the middle east after the Turkish series released " Hareem Sultan" , men started to imitate Sultan Sulaiman. And also there is another Arabic series " Saraya Abdeen" where Qusai Khoule " a Syrian actor did a big role and men started to imitate him. And maybe this trend extended to the west. The point from the name "Just Hair" that it's just hair that did not represent any terrorist action that's why people took it as a style later . It's like a hairstyle that varied each season. It's just a hair growing on the face nevertheless associated with racism. "Just Hair" will be done on A3 carton paper and the paint is water colors and markers. The technique is drawing. There is a drawing which is a cover book called " The Gigantic Beard That was Evil" by Stephen Collins. This book showed that even if you grow a beard you will not change your personality. The man in the book when he grew a beard , people thought that he is evil. But the author stated that the beard has never has links with any evil actions as well as terrorism. In the drawing the beard man sits behind a desk, he is posing holding a pen preparing himself to write. The whole painting drawn with pencil by Collins. The man's face features almost are not shown because of his giant beard that it reach the ground. I chose this picture as a reference because it sent the same message that I wanted to send through my artwork project. Racism has not been mention in any religion or culture, and it should not be existed. My name is Saeed Al Hefaiti. I started university in 2011, my major was business but I change it to international studies. My interests are Football. I like playing and watching Football, and watching movies.